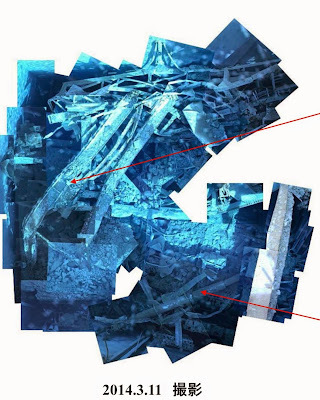 Just as the start of fuel assembly removal from Reactor 4's Spent Fuel Pool was anticlimactic, so is the removal of debris from Reactor 3's Spent Fuel Pool. No one reports it (not even the independent journalists these days), and TEPCO does not publicize. 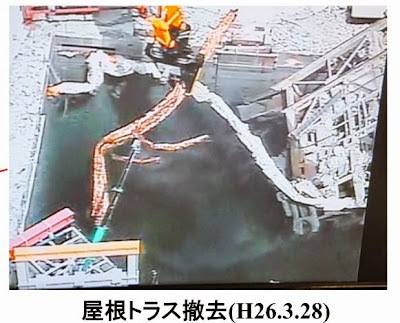 Having removed debris that was in the way of removing Fuel Handling Machine, TEPCO (and the main contractor Kajima) is now removing the Fuel Handling Machine itself, which weighs about 35 tonnes. 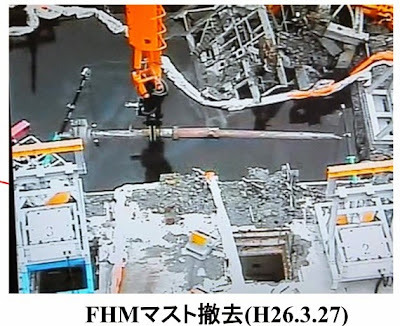 According to TEPCO's progress report, they are removing the debris that is in the way of removing the FHM, such as the main hoist pulley (which was removed on April 16, 2014), hoist frame, trolley frame, walkway, bridge, etc. After several hiccups (such as dropping the debris into the pool in February 2013 when they braved the heavy snow - low visibility - to do the catch-up work of debris removal, or dropping the camera into the pool in November 2013), so far so good, without major incident, since the debris removal from the Spent Fuel Pool itself started in December 2013. There has to be the videos of the debris removal from Reactor 3's SFP, but they are not posted at TEPCO's website for public view. From the description of the work, though, the videos would be extremely boring, with the slow (probably excruciatingly so) and deliberate remote-controlled heavy equipment taking eternity to grab one piece of debris. All my posts about Reactor 3 are here. People at Umi-Labo ("sea laboratory") in Iwaki City, a non-profit citizens' group, went near TEPCO's Hirono Thermal Power Plant, Fukushima II (Daini) Nuclear Power Plant, and Fukushima I (Daiichi) Nuclear Power Plant for the second time on April 27, 2014 on a fishing boat that had survived the March 11, 2011 tsunami. They came as close as 1.5 kilometer from Fukushima I Nuclear Power Plant. Apparently, there is no restriction that prohibits anyone from going near Fukushima I Nuclear Power Plant by boat. So far, I only know of this group that has done that. No research institute nor nuclear expert (other than IAEA) has bothered. The air radiation level on the boat at 1.5 kilometer from Fukushima I NPP was 0.05 microsievert/hour, surprisingly low, due to the shielding effect of water (ocean). 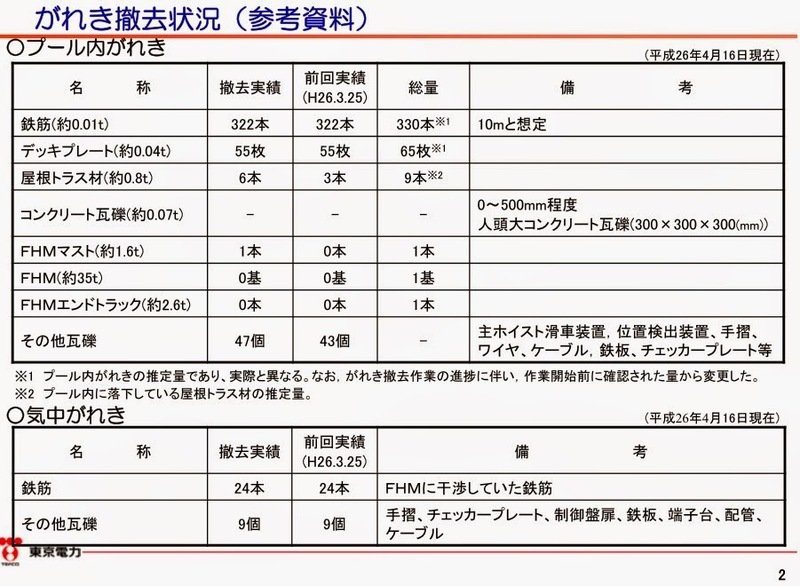 The ocean soil sample taken at Fukushima I NPP contained 417 Bq/Kg of radioactive cesium, whereas the ocean soil sample taken off Iwaki City had 287 Bq/Kg. In the Mainichi article, the captain of the fishing boat says, "Isn't it amazing, how small Fukushima I NPP looks from the ocean? And this small plant is troubling the world." He had saved his boat by riding the tsunami waves on March 11, 2011. 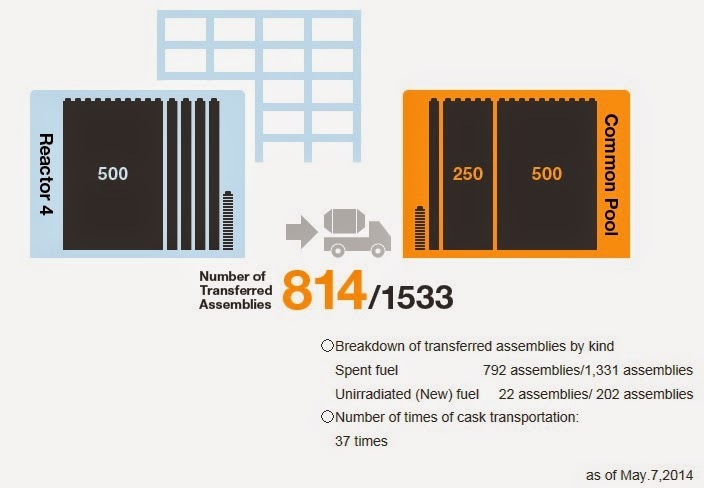 As of May 7, 2014, 814 fuel assemblies (22 new (unused) assemblies, 792 used fuel assemblies) out of the total 1533 in the Reactor 4 Spent Fuel Pool have been successfully removed. 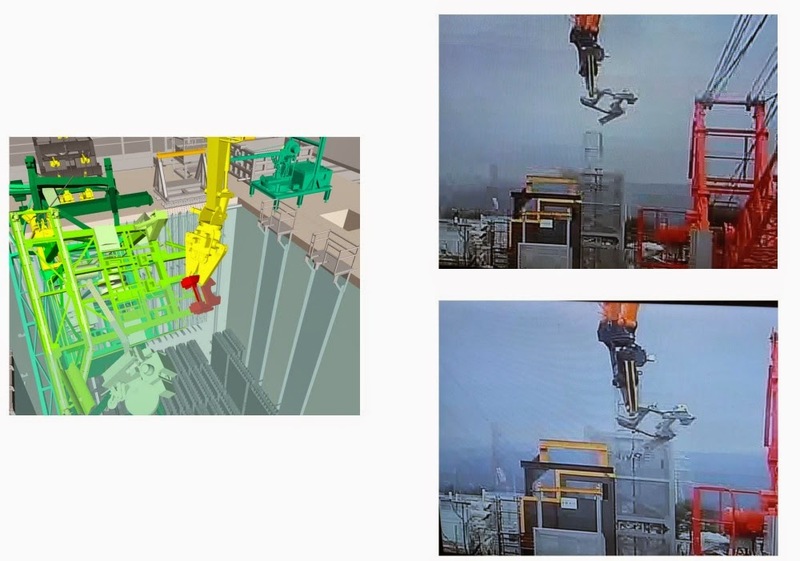 Removal of the fuel assemblies in Reactor 4's SFP started on November 18, 2013. At this pace, it will be completed sometime in November this year, as scheduled. This job seems to be about the only one job at Fukushima I Nuclear Power Plant these days that is carried out without a major glitch or accident, though with a significant radiation exposure to the workers who manipulate the Fuel Handling Machine on the platform above the pool to remove the fuel assemblies. The bulk of radiation comes not from radioactive cesium but cobalt-60 in the water, according to Nuclear Regulation Authority. As Japan's Prime Minister Abe tours Europe, he is securing the cooperation from Europe's largest nuclear nations that he hopes (I think) will enhance the status of Japan as a major nuclear nation and secure the nuclear future for Japan. With France, Mr. Abe is offering Japan's Monju fast breeder reactor to conduct tests for the Astrid. The European Sustainable Nuclear Industrial Initiative is funding three Generation IV reactor systems, one of which is a sodium-cooled fast reactor, called ASTRID, Advanced Sodium Technical Reactor for Industrial Demonstration, Areva, CEA and EDF are leading the design with British collaboration. Astrid will be rated about 600 MWe and is expected to be built in France, with construction slated to begin in 2017 near to the Phénix reactor. Mr. Abe is eager to justify Japan's fuel cycle policy, and he wants to make nuclear technology and military weaponry as two of the major exports from Japan for which his government wants to become the top salesman. TOKYO -- The Japanese and French governments are working toward an agreement to cooperate in the development of fast reactors, a technology designed to reduce nuclear waste. Prime Minister Shinzo Abe and President Francois Hollande will likely affirm the partnership in Paris on May 5. The agreement would build on an earlier comprehensive partnership formed last June in the field of nuclear energy. Fast neutron reactors convert spent fuel, which remains radioactive for tens of thousands of years, into materials that emit radiation for just a few hundred years, thus helping to reduce overall nuclear waste. When put into practical operation, such a reactor would generate electricity and cut down on nuclear waste at the same time. France is developing the Astrid (Advanced Sodium Technological Reactor for Industrial Demonstration), which it plans to start operating around 2025, but it lacks sufficient reactors to conduct tests. Japan will offer up its Monju prototype fast breeder reactor, which has been idle due to safety concerns, for the tests. Good luck France. Workers, engineers, and scientists at Monju say they are not comfortable working there, unsure about safety. Then, TEPCO has announced that they will closely collaborate with the UK's Sellafield Ltd. whose expertise in decommissioning a troubled reactor could benefit TEPCO in decommissioning Fukushima I Nuclear Power Plant. 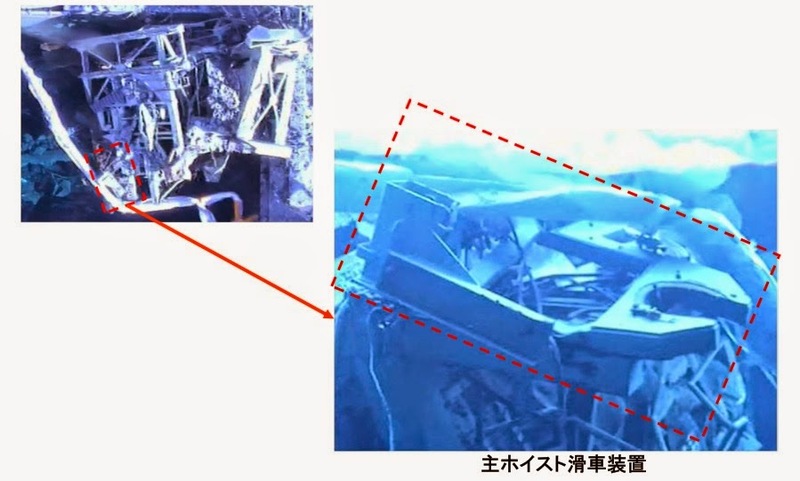 The Windscale accident was an INES Level 5 accident. Tokyo Electric Power Company (TEPCO) considers it would be beneficial to share expertise with overseas operators which have similar decommissioning experience, to decommission Fukushima Daiichi Nuclear Power Station. TEPCO has agreed with Sellafield Ltd. on exchanging information relating to the management and technology of decommissioning, towards a safer and stable decontamination and decommissioning at Fukushima Daiichi Nuclear Power Station. Sellafield Ltd. is a company in UK which has engaged in the decommissioning of a reactor and radioactive waste facilities. On ahead of the formal information exchanging agreement, the two companies signed a cooperation statement, which clarifies the objectives and significance of the agreement. Positive support of the UK Nuclear Decommissioning Authority (NDA) etc. About technologies/knowledge of Sellafield Ltd.
Sellafield is working with the decommissioning of the Windscale nuclear reactor, which suffered radiation leak (INES-5). It is clear from the comment by Mr. Naohiro Masuda, Chief Decommissioning Officer of a new TEPCO company called Fukushima Daiichi D&D Engineering Company, that this deal was brokered by the Japanese government and the UK government, regardless of whether TEPCO wanted it or not. Mr. Masuda was the plant manager of Fukushima II (Daini) Nuclear Power Plant, which came very close to core melt after the loss of power after the earthquake on March 11, 2011. What the workers did under his leadership and why the core melt did not happen at Fukushima II would be worth recalling. In this post-Lehman "New Normal" world, particularly in the so-called developed nations of the US, Japan and EU, 22 straight months of wage decline must mean wages are rising. Governor Haruhiko Kuroda of Bank of Japan had an exclusive interview with the US's financial news channel CNBC while attending the Asian Development Bank meeting in Kazakhstan. Kuroda starts out by declaring that economists have been consistently wrong about Japan in the past twelve months because they have failed to predict the inflation that is actually happening. Kuroda: (cutting the interviewer off) But that, that is not true. Actually, wages have started to rise. We expect uh nominal wages uh continue to rise, coupled with improving employment situation, means that employer's (sic) income would increase by about 3%. I am sure Mr. Kuroda meant "employee". 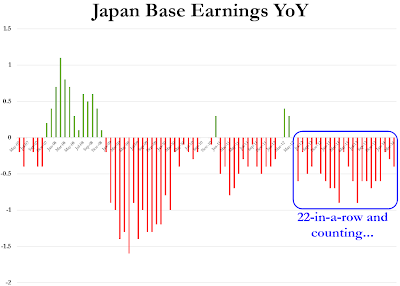 For sure, Japan's employers, particularly large multinationals, are raking in huge revenues, partly thanks to cheapened yen. 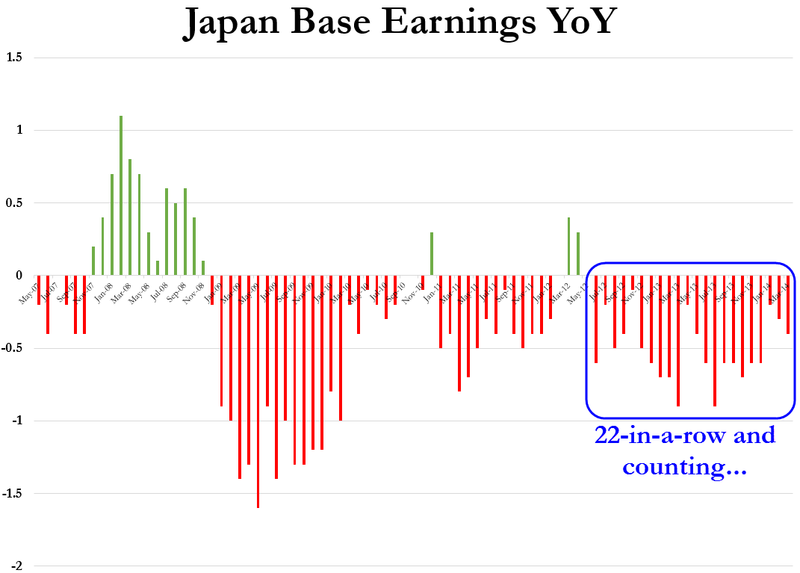 Then Kuroda prattles on about employment situation, and Ms. Li drops the topic of wages completely. So are wages in Japan rising, or falling, in the reality-based world? "monthly wages excluding overtime and bonus payments fell 0.4 percent in March from a year earlier (the biggest drop in 2014), a series of declines which has now stretched to 22 consecutive months." According to the monthly labor statistics (preliminary) announced by Ministry of Health, Welfare and Labor on April 30, the average total wages including overtime increased by 0.7% in March compared to a year ago to 276,740 yen [US$2760] . It was the first increase in three months, and the rate of increase was the biggest in two years. The increase was due to the increase in overtime pay, to meet the last-minute demand [for goods and services] before the sales tax increase [on April 1, 2014]. On the other hand, fixed wages, or base wages dropped by 0.4% to 240,656 yen [US$2400], decline of 22 consecutive months. As far as I know, when comparing wages over time or across different regions/countries, you don't include overtime pay, benefits, or one-time pay like bonuses. But that's not Kuroda BOJ, apparently.